Welcome to the first of many blog posts about something new bubbling away in our Labs: Tellytopic. Tellytopic is the first end-user prototype to come out of ABC-IP, a TSB-funded project we’re working on with BBC R&D Prototyping around the automatic linking of archive content. 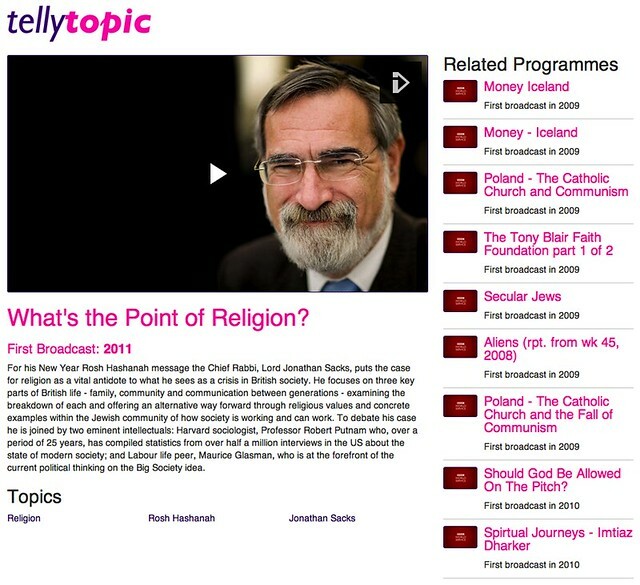 This is the first version of Tellytopic, building on top of some great work by the BBC to automatically generate topics from audio as well our own metadata expertise. We’ve been thinking about in-programme metadata and automated linking for some time, and as we’ve seen with things like the recent launch of zeebox, metadata about the content of programmes and the discussions around them are becoming ever more important. With things like our existing product Leaf, Tellytopic and the other parts of ABC-IP, it’s another area where MetaBroadcast is on the leading edge. With these three sets of data in Atlas, we then used the programme equivalence matching in Atlas to match them together. This produced metadata, topics and media locations for each unique programme based on a combination of all the available data. This equivalence matching means Tellytopic allows browsing programmes from BBC Programmes and the World Service archive and navigating between them using a combination of tags produced automatically and assigned editorially. The ‘Kenya’ page below shows how this works. It displays a mix of content from both BBC Programmes and the World Service archive together on the same page. Both sets of programmes have topics and so can be displayed together in the same way. Atlas takes care of all the differences under the hood. The next bit of magic happens on the programme pages themselves. The clever matching in Atlas also extends to programme availability. Normally when a programme goes outside the iPlayer catchup window it is no longer available. In Tellytopic, Atlas merges together availability information from the three different sources meaning that you can watch or listen to programmes from BBC iPlayer, BBC Redux or the World Service archive depending on where they are currently available. Tellytopic also generates recommendations for similar programmes by finding programmes with similar tags. For tags, similar tags are determined by looking at the other tags of programmes with a particular tag. This is an area we hope to explore further in the future. Taking disparate sources of data and matching them together to create a larger, more complete set of data in one easy to use form is a part of Atlas we’re very proud of and that has already proved very useful, including for the RadioTimes, so it’s great to see what it can do with access to a large archive. Tellytopic provides a useful, interesting and unique first usage of this data that demonstrates the power and value of automatic linking. It’s already been used by the project team to visually explore the results of the automatic tagging, helping to inform future changes to the underlying algorithms and the relationship between editorially selected and automated tags.